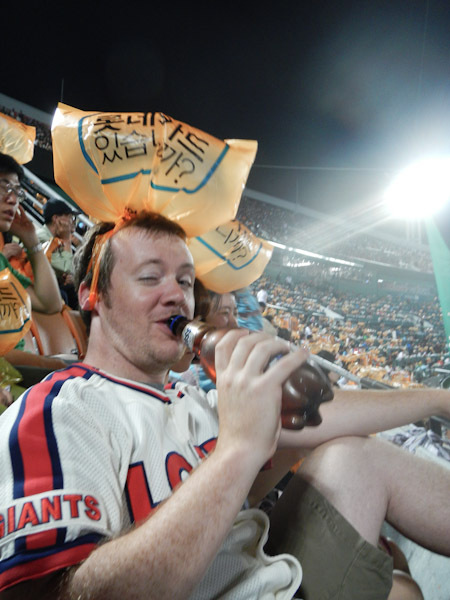 One thing we definitely wanted to do in South Korea was see a baseball game. 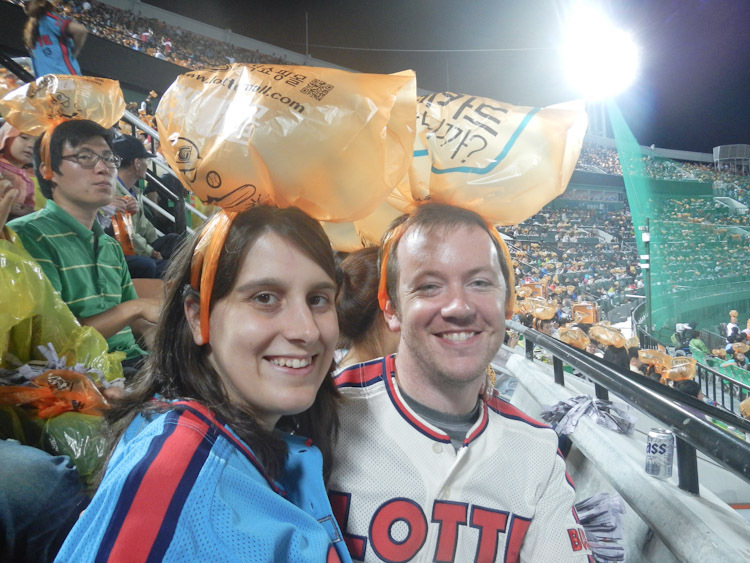 We'd heard that baseball was the most popular sport in Korea, and we'd also heard that the fans were a lot of fun. 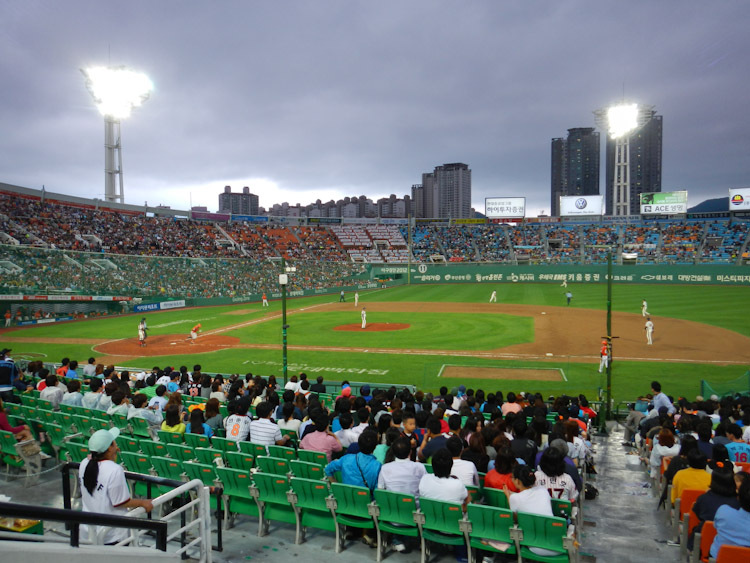 When we arrived in Busan, we found that the home team was playing while we were there and resolved to go to the stadium to try to buy tickets before the game. 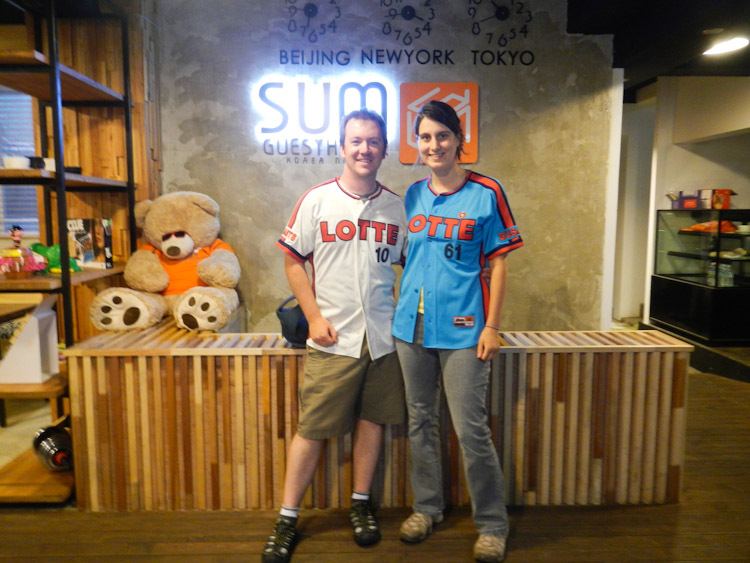 Luckily for us, we mentioned our plan to Jay, one of the employees at SUM Guesthouse where we were staying in Nampo. He let us know that, unlike in Toronto, it was pretty likely that the game would sell out in advance. 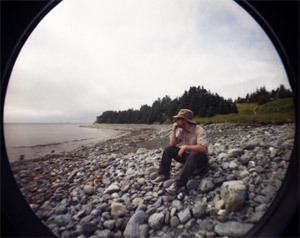 He said he'd been thinking of going with a friend of his, and offered to buy two more tickets online for us, and then we could all go together. We were getting excited now! The next day, we explored Gamcheon in the morning, and then headed back to meet Jay at the hostel before game time. Jay had even brought jerseys of his for us to wear to the game! We were sad to hear that Jay had actually given up his ticket so that his friend's friend could go, but he generously agreed to come with us to the stadium anyway so he could pick up our tickets and show us the way. One of the things that makes the Korean baseball experience much different from that of North America, is that you can bring whatever you want into the stadium (well, except for glass bottles and probably guns). So before the game, we joined 10,000 other fans in hitting up a nearby department/grocery store (which honestly dwarfed Walmart by a good margin) to buy some beers an snacks. Luckily, we spotted a guy selling tickets outside the game, and Jay and another of his friends were able to secure two more tickets from a scalper! At first I thought the fans seemed pretty tame, and there seemed to be a lot of empty seats for a sold out game. It turns out everyone was just buying beer still, and by the end of the first inning the stadium was packed and things got crazy. A cheerleading team consisting of a 4 girl dance team and a male head cheerleader got the chanting and singing going. The sponsor for the Busan team is Lotte, a massive conglomerate that seems to have a hand in just about everything in South Korea. They are probably best known for their department store though, and so about half way through the game, everyone is handed a Lotte shopping bag to tie on their head. Drinking cheap beer while wearing a shopping bag tied to your head is undoubtedly the origin of the phrase "half in the bag". I promise I look about 50% more hammered in this picture than I actually was, but it was too hilarious not to share. The game turned out to be pretty exciting, and it's always fun when the home team wins. Really though, the funnest part for us was watching the fans. I don't know how they remember the words to all these songs. Each player had their own song, and there were probably a dozen other cheers that it seemed like everyone knew. I hope that someday North American stadiums can loosen up and let you bring a bag of goodies to the game - it's just way too expensive to be a regular Jay's fan as it is now. 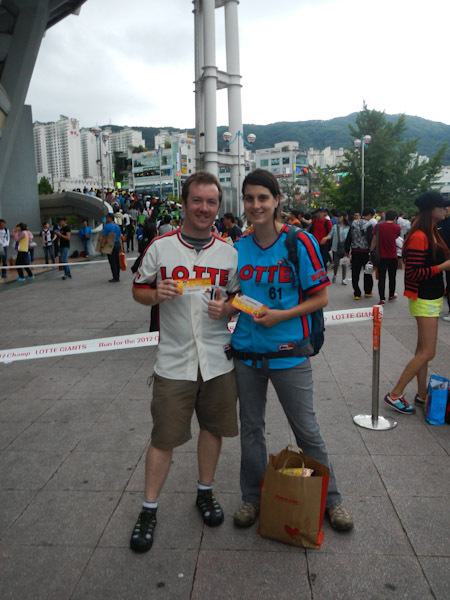 We sat on the first base line for $5/ticket, and our bag of goodies (12 cans and various chips/snacks) was around $15. Even if you include the subway tickets to get to and from the game, we're still out for under $30. That's less than a single ticket would have cost for our seats in the skydome. All-in-all, watching a baseball game in Korea was one of the highlights of our trip so far; high praise from someone who prefers soccer!